You might think you have stories to tell. You might even think you have met or worked with some pretty important people in your time. Got that picture of you and so-and-so on the mantle in the living room above the fireplace, framed just right, so that whoever comes in the house will be sure to see that you know certain people. You need to stop. Just…stop. Because Virgie Rollins. Have you ever heard of Virgie Rollins? There’s a good chance you probably haven’t, so don’t feel bad. She admits to a preference for keeping herself more in the background. But all those Big Name folks whose names you see in the paper on a regular basis? You’d best believe they know Virgie Rollins. And Virgie Rollins knows them. All of them. Matter of fact, she has their personal cell phone numbers. No, not just the mayor or city council, although they certainly rank high enough on the local scene. But think bigger. For example, take a look at that picture of President Barack Obama speaking to a small crowd assembled on her front lawn. And then the one of her “hanging out” with First Lady Michelle Obama on the night that Obama was first elected. Or how about that photo of her with Muhammad Ali taken in her back yard? Or the one of President Bill Clinton? Or Hillary Clinton? Bernie Sanders? Jimmy Carter? And you might want to take a look at that picture of Rollins with Mayor Coleman Young during his first mayoral campaign, which is where she got her start. “I’ve helped a lot of people get elected from judges to state reps,” she said. But Democratic presidents who want to get the Michigan nod all know they have to come by Rollins’ home as well. 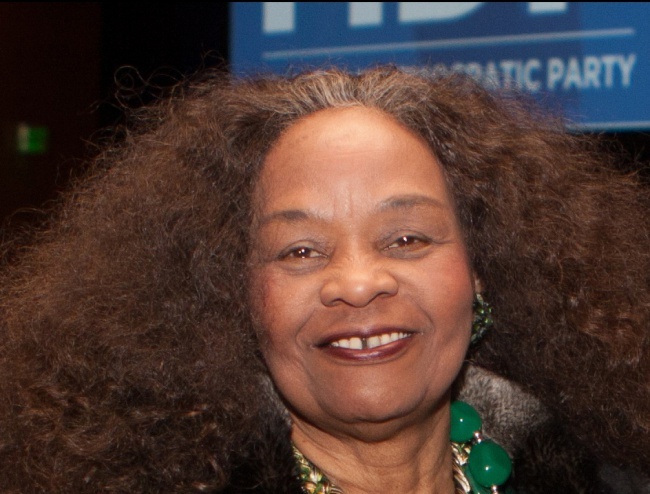 For the past 12 years, Rollins has served as the Chair of the Democratic National Committee Black Caucus. That alone is pretty impressive, but it doesn’t begin to scratch the surface of Rollins’ truly remarkable story as one of the most influential and widely respected political operatives in the entire state of Michigan. “I’m a COGIC [Church of God In Christ] bishop’s daughter. I moved to Detroit [from Benton Harbor] and married a COGIC bishop’s son,” she said. Virgie, and her husband Michael, have been married 50 years this year. She is the seventh of 16 children. Virgie and her husband have two grown sons, Michael and Martin. “And so Angela Davis, Huey Newton, and all them come. And so where do they want to meet? At the bishop’s house. At our house. So my husband is working for Chrysler, and he comes home and I just got all into it. And they had all these guns and they were talkin about we gotta start shootin and reorganizing. And they were organizing this big rally and H. Rap was gonna be speaking,” she said. To say the least, an interesting beginning. Because when Rollins first moved to Detroit, she was a biological researcher for Whirlpool. But that changed once she became intrigued with politics, soon studying under the wing of political kingmaker Robert Millender and then volunteering to work for John Conyers’ campaign. She also spent a lot of time listening and learning as she took notes during the meetings when local politicos, community leaders and black union activists were working hard to get Coleman Young into office. Once Young was elected, Rollins was hired as the mayor’s political strategist and her life would never be the same again. Still, “Coleman Young was the best adventure of my life learning politics.” Two weeks after she left Mayor Young to ‘take a break’, Rollins got a call from Gov. Jim Blanchard asking her to come work for him. One of the lessons was that it wasn’t always easy working for Coleman Young. Another lesson was that, when working for powerful people, it’s important to know who you are and stand your ground. Rollins most definitely knows who – and whose – she is, and if you don’t think she can hold her ground, try pushing her around sometime. “Let me tell you what happened; Coleman Young endorsed [former Wayne County Executive Ed] McNamara against Bill Lucas. So I helped McNamara get the campaign. Well by the time McNamara ran again, I was working for the governor. …So when McNamara decided to run the second time, I was all in the paper. Oh man, they dogged me. They were saying, McNamara better win. “Coleman was mad because he had put McNamara on the Water Board, and he would sit on the Water Board and raise those rates up high. Then he’d go downriver and act like he didn’t have nothing to do with it, it was all Coleman. And turned them folks against Coleman. “So Coleman was running Sam Turner, and I said Mr. Mayor, I gotta go help this white man because he’s gonna win, and you got to have somebody black over there. And he said, ‘I don’t care.’ And I said ‘Bubba can’t win (Young called Sam Turner Bubba according to Rollins). Plus he got a white wife. He was a smart man, but he didn’t have a chance against McNamara who had already ran before. Rollins, who became McNamara’s political strategist, knew she had to get 27 percent of the Detroit vote to get McNamara elected. So Rollins left Gov. Blanchard after an 8-year run, where she had served as assistant director for the Department of Licensing and Regulations, and went on to serve another 8 years as Assistant County Executive under McNamara. Then she went to work as a consultant for President Bill Clinton’s U.S. Department of Commerce Secretary Ron Brown, a job she described as “one of the best jobs I ever had” until Brown was killed in a plane crash in Croatia in 1996. Following that tragedy she became a consultant for two other Clinton cabinet members; Secretary of Labor Alexis Herman and Secretary of Transportation Rodney Slater. When President Bill Clinton was first elected, Rollins remembers being in the thick of it all as her first major exposure to national politics. She played an instrumental role in getting Clinton elected. “So let me tell you what happened; all the wannabes, and the big shot union guys, they endorsed (Senator) Tom Harkin. So I did this reception for Bill Clinton, and nobody wanted to come except for the little people and the precinct delegates. And then Bill Clinton won. OK? And then everybody wanted to be my friend. Rollins later became the chair of the National Federation of Democratic Women from 2001-2003, for which she led two delegations to Taiwan, the first under President Clinton, the second under President Obama, whose wife, incidentally, Rollins introduced at the the 2012 Democratic National Convention. C. Delores Tucker, Rollins’ mentor, was the first African American woman to chair the Federation. Rollins also served as chair of the Michigan Democratic Women’s caucus. These days, Rollins travels to the White House approximately twice a month, mostly to run focus groups on various issues. She is cleared to travel on Air Force One, which she has done a number of times. And she is working hard to make sure Hillary Clinton becomes the next President of the United States – although she admits her early preference was for Bernie Sanders (who was also a recent visitor to her home, as several photos confirm). Though some higher-ups in the party establishment did not approve of her preference, Rollins has never had a problem putting certain folks in their place. It’s a useful skill to have when working in politics, especially at that level. Which means it’s time for another story, this time about 2016 presidential candidate Hillary Clinton, who apparently did not consider it necessary to contact Rollins during her three campaign visits to Michigan – which she lost to Sanders. Rollins, by the way, remains a non-committed super delegate. She remembers the calls she received from the Clinton camp after Clinton had been here and gone. Rollins hosted 120 people at her home for Sanders. This was two months ago. Bernie Sanders went on to win Michigan in one of the biggest upset victories of the 2016 presidential campaign season. What matters most to Rollins is that she has been able to use her life to make a difference in the lives of others.